Last week, we explored the golden age of advertising, a time where creatives were at the top of the world and account men could do anything they wanted. Today, we will explore one of the biggest names in the history of advertising: David Ogilvy. When I first started learning about the advertising world, David Ogilvy's name always came up. Some call him the best advertiser in history. He may have had his critics, but they man did work. 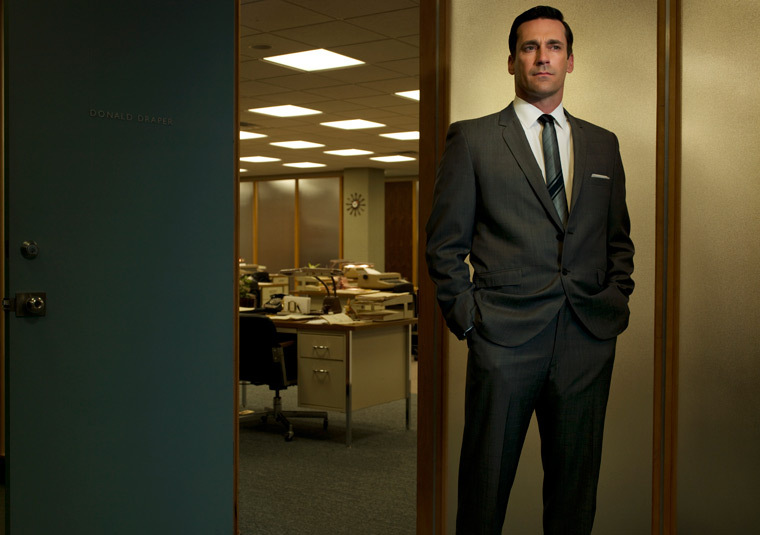 His ads are some of the most iconic we may ever see and he set a new standard for advertising. 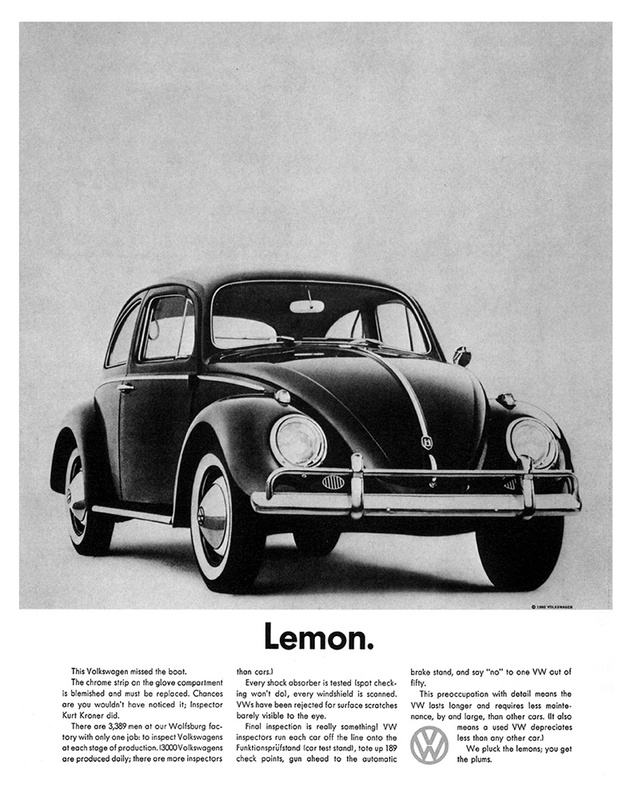 One of his more famous ads for Volkswagen is even referenced in an episode of AMC's Mad Men. Research - Oglivy came from a market research background, so his perspective is that they should know about their customers and craft messages that would actually speak directly to them. Professional Discipline - This comes, again, from his research background. Ogilvy had tons of information that he had gathered over the years. He used this information and used it very well. Creative Brilliance - He had a huge focus on the "Big Idea" that would tie an entire advertising campaign together and provide unity across all media. Results for Clients - Ogilvy wanted to make sure his clients were getting what they paid for: an increase in sales. Some of us may remember the ads I'm sharing with you today. They are iconic and were very successful. The first ad is a great example of Ogilvy's research skills and started his meteoric rise to the top of the heap. 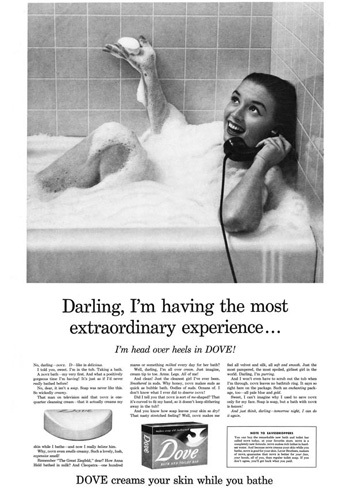 This ad for Dove soap is what garnered Ogilvy's agency so much attention because it helped dove become a profitable company within its first year. Ogilvy and Dove's guy were having a tough time finding an angle to go with for the campaign. That's when Ogilvy asked for the formula. He discovered that Dove soap formula contained 1/4 "cleansing cream" and this the "Big Idea" that launched such a successful campaign. Here's the ad. You can click any of these pictures to make them bigger. Unique, intriguing, and beneficial. This ad was great in so many ways, but mainly because it sold soap. The next ad is a great example of the "Big Idea" that Ogilvy was so crazy about. 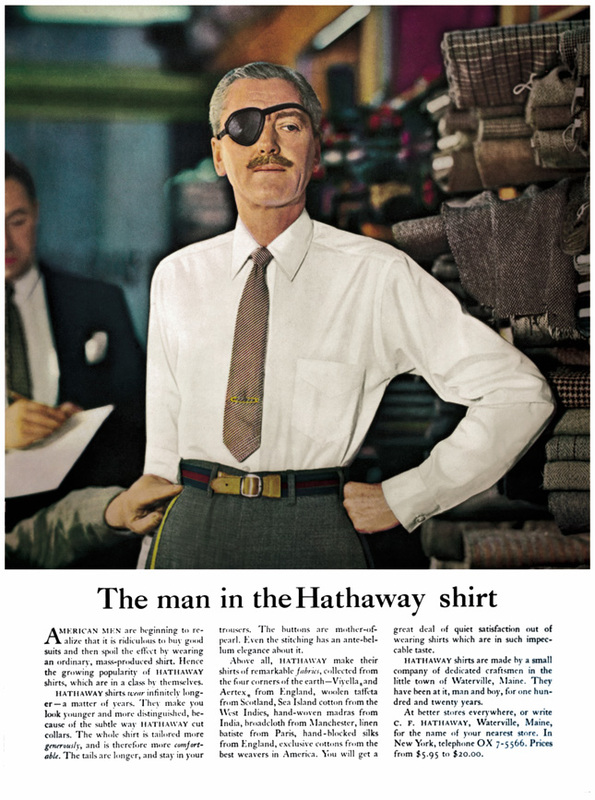 In this ad for Hathaway shirts, Ogilvy creates story appeal by featuring a dashing man with an eye patch. Why does he have an eyepatch? A bar fight or maybe a war incident? This gets the customer thinking about the ad and eventually brings attention to the shirt brand. The next few ads are outstanding examples of how Ogilvy used a simple yet bold headline to attract and hold a reader's attention. 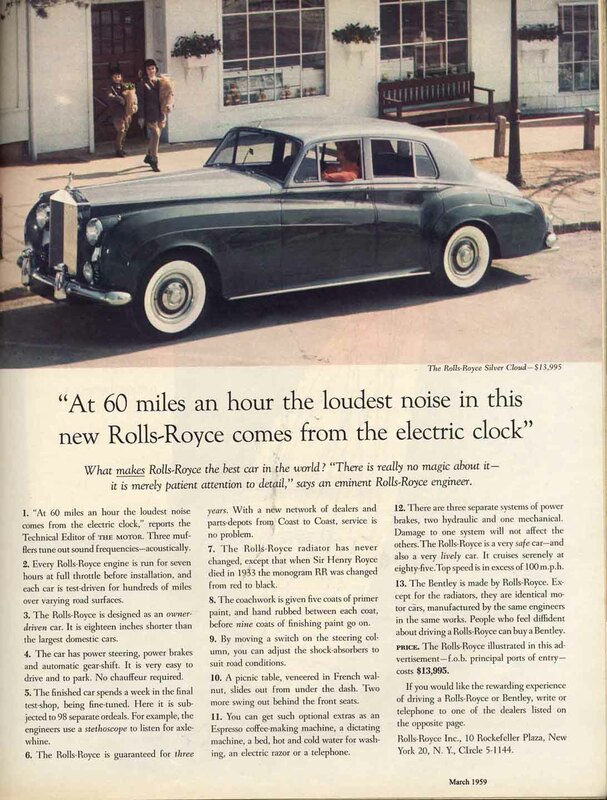 The first headline, for Rolls Royce, was crafted after the copywriter found the phrase in an engineering manual for the car. Yet another example of great research. The next two ads for Volkswagen feature headlines that go against conventional. 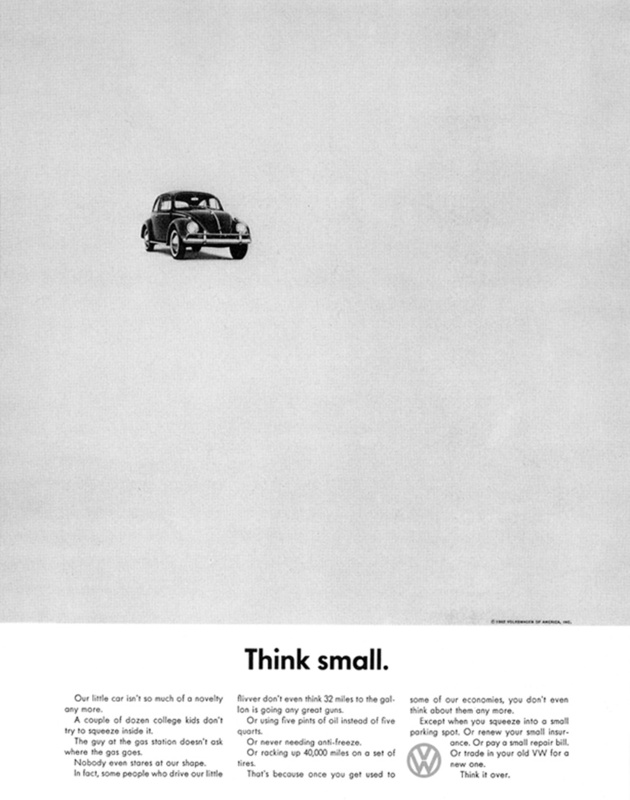 They call the Beetle a "lemon" and go against the grain by telling the buyers of big cars to "think small." These are both example of genius copywriting. You may have noticed a trend in the layouts of these ads. This is another Ogilvy signature and a standard that many contemporary ads follow. The idea is to capture attention with a story telling photograph, peak interest with the headline, and make the selling points in the body copy. Man, I love this stuff. That wraps it up for this week's edition. Next week, we'll dive into another great from the Golden Age, Leo Burnett, and some of the great things he did for advertising. Until then.